MADISON, Mississippi, March 21, 2019 /PRNewswire/ -- Vertex Aerospace has been selected as a qualifying offeror and awarded a contract under #N61340-19-D-0010 for the Naval Air Systems Command's Contracted Maintenance, Modification, Aircrew and Related Services program. This award will allow Vertex to compete for approximately $12.6 billion of future Department of Defense aviation logistics opportunities over the next five years. Awardees of the CMMARS contract will provide contractor logistics and maintenance services for DOD rotary and fixed wing aircraft, unmanned aircraft vehicles, and various weapon systems in support of continuous, worldwide operations for the Navy and other DOD & U.S. government agencies. Vertex's Aerospace Defense Services business line Senior Vice President and General Manager Richard Caputo says Vertex is ready for the challenge and excited to explore new opportunities within the DOD. "This award provides Vertex Aerospace the opportunity to display our full arsenal of capabilities, which includes aircraft maintenance, logistics, and integration sustainment services," said Caputo. "We have served the U.S. Army, Navy, Air Force, and Marine Corps for over 20 years and are honored to continue providing high-quality, mission-critical services in support of our warfighters." The majority of the CMMARS contract services will be performed afloat and ashore within the U.S. and will be administered by the Naval Air Warfare Center Training Systems Division in Orlando, Florida. Vertex Aerospace is a global aerospace company that provides rotary and fixed wing aircraft maintenance and logistical solutions for government and private sector customers. The Mississippi-based Company has over 4,200 employees at its 65 U.S. and 35 international locations and employs over 1,900 veterans. Information about the company and job announcements can be found on the Company website at www.vtxaero.com, LinkedIn, Facebook, or Twitter. 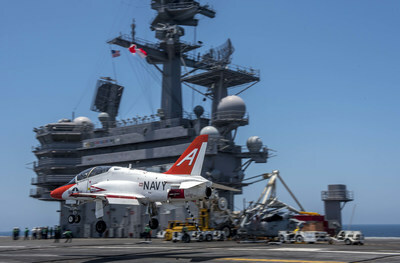 NAVAIR Public Release 2019-116. Distribution Statement A - Approved for public release; distribution is unlimited.